It's been 5+ years since I got my first bluetooth intercom system, so I was thrilled to receive such a fantastic upgrade from my friends at Sena. I previously had a now defunct BlueAnt Interphone (it seems that they stopped making motorcycle headsets) and that system was definitely on its way out. When I first saw it's bigger brother, the SMH10, I knew I wanted one. The 10 just seemed so big compared to my old BlueAnt, I was happy to see a smaller set come out and knew that would be a much better choice. The SMH5 is identical to it's bigger brother in form and function, with the exception of a few minor features. First, you'll have a shorter range with only 0.25 miles vs. 0.55 miles. And you can only intercom with one other rider, whereas with the SMH10 you can have a 4 way conversation. Who needs to talk to that many people while riding, anyway? You can still listen to your music, initiate and answer phone calls and use your gps navigator for directions. To see a full list of specs for the SMH10, click here. For me, the features on the SMH5 are more than enough for what I need. What really sold me on the Sena above all other systems is the easy to use, intuitive jogdial / button. No other system utilizes this feature, because Sena patented it and it's all theirs. There are only two buttons that you ever need to use. The jogdial and the red phone button. Even that is easy to feel with gloves on, and you'll only need to use it to call up the voice dialing features on your phone or to answer / initiate phone calls. Not having to deal with small, flat buttons that are impossible to feel with gloves on (even kangaroo ones) is simply awesome. Along with communicating with your loving riding partner, you can also make and answer phonecalls, listen to your ipod/mp3 player and communicate with your gps device. I've only used the Sena with my iPhone so I'm not familiar with how easy it is to use with a gps device. I've mainly used mine for radio / ipod use. My husband and I have gone on several day rides and I used it recently for 2 long weekend trips (without my husband). I used it for both trips and found my headset lasting longer than my iPhone when it came to listening to music. If it only had as much battery life for music as the Sena, I could've listened to music all day. The one thing that I was worried about was whether or not it would allow both of us to listen to our own iPods, and then toggle over to intercom eachother if necessary. The answer is YES! With one short press of the jogdial, you can toggle to your partner. Another press and your music resumes. Voila. You're not stuck talking to someone the whole time, but you can interrupt them anytime if need be. The talk time is superb, as I've just used it for a 4 day riding weekend and it easily lasted all day listening to music for most of the day. I never fully used up the battery, but definitely pushed it to the lowest levels. It definitely outlasted my iPhone. Setting up the system is easy too. Depending on how your cheekpads are designed, you can either use the clamp mount or the sticky mount on the left side of your helmet. I've got separate photos below just for the Shoei Qwest since you can't remove the headliner, it requires a little extra effort. With the Arai Vector, the problem is that there isn't enough space until further back on the helmet, too far back for me to reach and operate the headset. So I had to opt for the sticky mount. Included in the dual kit is 2 headsets with 2 of each of everything you will need. They include the larger boom mic (for better speaking volume and noise reduction) but if you find the boom mic to be too large, you can buy the optional flat microphone in case there's not enough room in front of your mouth. This could be the case if you wear an Arai, since they're shorter helmets from front to back. I use the boom mic and it's never in my way. Also included is a little mount for the mic cable so it stays right up against the inside of the chinbar. When you mount the ear pieces you may need to install the velcro pods that will mount the earpieces closer to your ear. On my Arai (below), I had to add the pods to the cheekpads themselves so that the ear piece wouldn't be too far away. Pairing is a cinch, the user's guide is straightforward and easy to understand. They give you step by step instructions (written in real English, not engrish) with photos and clear descriptions. 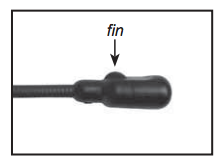 Please make sure that the fin side of the microphone is facing outward; away from your lips. You can easily recognize it by touching the fin with your fingers. Because you can't remove the headliner on the Qwest, it can be a little harder to hide the earpiece cables since you can't route them over the centerpad. Instead, the single cable that connects the earpiece to the unit needs to be tucked in on the back. You really need something to drown out the high pitch, harsh wind and road noise so you don't have to crank the volume up all the way. It'll also make understanding your intercom partner much easier. Same goes with listening to music. The quality is much better than my previous headset, and about the same as my old apple earphones. They're not Bose or anything, but the sound is clear and the music comes through nice and clean. I've listened to music at freeway speeds, and found that I do need to turn the volume almost all the way up. I think it's partially due to my helmet, and how close the speakers actually are to my ear. Make sure you use the pods to make sure the speakers are mounted away from the EPS liner of your helmet and as close to your ears as possible. My husband forgot to do this and noticed an increase in sound volume after adding them. When we intercom with one another, we have found it difficult to hear eachother at freeway speeds. I'm unable to hear anyone who calls me, unfortunately. I can hear wind noise with both of my helmets, even with ear plugs, so I think I'd have better sound with quieter helmets, like the Schuberth C3 (intermediate/long oval shapes) or a Nexx XR1R (intermediate oval/rounder). I never have issues around town, or lower speeds, but once I get up to 60-65mph, it can be difficult to hear one another depending how loud it is. I've taken it on 2 long weekend riding trips with friends, and it was my best friend while riding the flat, boring freeways. I use it every day I ride to work and around town running errands. I have used it to answer a few phone calls here and there, but try not to use the phone very often. It's hardly noticeable in size and although the sound volume isn't as high as I'd like to be, I still think it's a fantastic headset and would highly recommend it to anyone looking for a smart, user friendly bluetooth intercom. Update 4/29/2014: I still use the Sena on my Shoei and Arai, just depends which helmet I want to wear! Since my version came out, the SMH5-FM has nice upgrades including an increase in sound quality and an FM Radio tuner built in.